Bluebirds becoming the Comeback Kings as they beat Wolves. That's three wins this season for Cardiff and in all of them City went a goal down first. Fulham (4-2), Brighton (2-1) and now Wolves (2-1) have all been beaten at CCS after taking first half leads. The win for Cardiff has lifted the Bluebirds out of the bottom three, for the time being at least, and has moved the club onto 11 points. It was a dramatic night at CCS in the wind and rain with the visitors ahead through Matt Doherty. City were undone from a corner after dominating the play until then. Dohery finished from close range after a superb reaction save from Neil Etheridge. Harry Arter smashed an effort again the post from distance and Cardiff continued to see a lot of the ball but had to be wary of the threat posed by Wolves on the break. But this is a Wolves side lacking confidence. They had lost four out of the last five and their free-flowing football was in short supply as City' back three dealt with the best Wolves had to offer. Cardiff continued to press in the second half and were rearded when Aron Gunnarsson acrobatically volled the equaliser on 65 mins. City sensed there could be a winner and when Junior Hoilett struck the most wonderful of finishes on 77 mins the comeback was complete and despite Wolves finally waking up City saw out the remainder of the game to take the victory. Hoilett's goal was so good, a curling right foot shot from the corner of the box. It went in off the underside of the cross bar making it impossible for the keeper to get to (pictured below). I mention Cardiff played with a back three. Neil Warnock had the fans talking when the line up was announced as he replaced a full back for a more attacking player. Next up we have midweek football. Cardiff are away at The London Stadium to face West Ham United, Tuesday December 4th, 7:45pm. Cardiff have won consecutive home games in the same top-flight season for the first time since 1961-62. This was the first time Wolves have lost a league game that they opened the scoring in since February 2017 (2-1 v Burton Albion), ending a run of 44 such games without defeat. Cardiff have won three of the past four Premier League home games in which they have conceded the first goal - coming back to beat Fulham (4-2), Brighton (2-1) and Wolves (2-1). Cardiff have picked up nine of their 11 Premier League points this season from trailing positions, the joint-most in the division alongside Arsenal. After losing just one of their first eight games in the Premier League this season (W4 D3), Wolves have since lost five of their past six (D1). 91% of Cardiff's points in the Premier League this season have been won at home (10/11); the highest ratio in the competition. Since the start of last season, Hoilett has been directly involved in more league goals (21 - 10 goals, 11 assists) than any other Cardiff player. 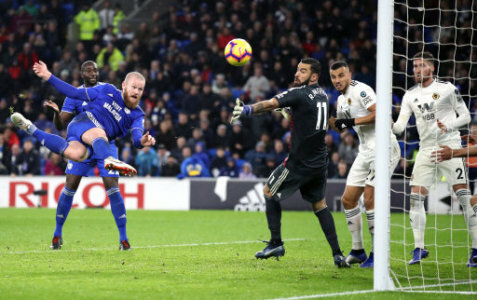 Gunnarsson scored his first Premier League goal since August 2013, when he netted the Bluebirds' first goal in the competition (v Manchester City). Cardiff City: Etheridge; Manga, Morrison (c), Bamba, Ralls; Gunnarsson, Arter (Harris, 76), Camarasa; Murphy (Decordova-Reid, 66), Hoilett, Paterson. Subs not used: Smithies, Peltier, Bennett, Ward, Mendez-Laing. Wolves: Patricio; Saiss, Coady (capt. ), Boly; Doherty, Neves, Moutinho, Vinagre (Cavaleiro, 82); Traore (Gibbs-White, 73), Costa (Jota, 66), Jimenez. Subs not used: Ruddy, Bennett, Giles, Bonatini.